Welcome Home Series<sup></sup> handlesets are the perfect addition to your front door to create a unique and fashionable entryway to your home. Each is stylishly designed to provide maximum-security protection. There are many styles, finishes and configurations from which to choose. The straight styling of the Aspen lever creates an elegant, contemporary feel Both knobs/levers can be locked or unlocked by key on the outside, or turn button on the inside. The crisp, clean appearance of the Satin Nickel finish adds to the overall look of the product and brings a modern feel. Featuring a Lifetime Guarantee, DEFIANT<sup></sup> meets or exceeds ANSI Grade 3 Standards for residential use. This lock features a drive in latch with an adjustable backset and optional radius cut faceplate . Locks can be re-keyed to fit your existing KW1 keyway. The Powder coated finish will provide years of durability. When used as a replacement lock only a screwdriver is need to make installation a snap. Affordably outfit exterior doors with this lockable lever set from Defiant. The Olympic keyed entry lever easily mounts to doors 1 3/8-inch to 1 3/4-inch thick with the included hardware. Perfect for all entry doors where security is desired. Provided with this set is an adjustable backset and interchangeable faceplates for drive-in and traditional installations. This sturdy lever nicely coordinates with other fixtures in your home for a cohesive look. A lifetime warranty ensures that this device will withstand frequent use. Are you looking to give a face lift to your home? Why not start with locksets? Forge various collections will add a touch of style and offer you a top notch mechanism that has proven history. Our collections are offered in various styles, function and finishes. The Elements Series<sup></sup> provides an expanded choice in Fashion Doorware at an affordable price. In decorating your home, choosing the right paint, wallpaper, tile and trim is important in creating a personal design. The Elements Series of Fashion Doorware will support and enhance your decorating decisions. A clean, streamlined design on the Kim fits a wide range of decorating styles: from traditional and ranch to contemporary. Both knobs/levers can be locked or unlocked by key on the outside, or turn button on the inside. The Satin Chrome finish gives the product a modern and minimalist look. 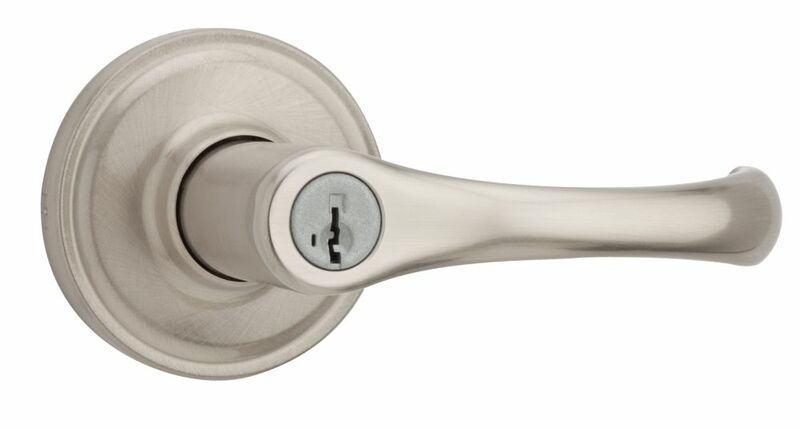 Aspen Satin Nickel Entry Lever Welcome Home Series<sup></sup> handlesets are the perfect addition to your front door to create a unique and fashionable entryway to your home. Each is stylishly designed to provide maximum-security protection. There are many styles, finishes and configurations from which to choose. The straight styling of the Aspen lever creates an elegant, contemporary feel Both knobs/levers can be locked or unlocked by key on the outside, or turn button on the inside. The crisp, clean appearance of the Satin Nickel finish adds to the overall look of the product and brings a modern feel.